And despite the desire to bury myself in a comforter and watch movies tonight, I will be going to my swim class and acclimate to the coldish water and swim! Luckily I found my goggles so I don't think my eyes will get irritated tonight. The pullups are still a struggle. Getting the 75 lbs off the ground started to be a struggle in the 4th round but I did it! And it was the "rx" for women. The overhead squats were hard today! I am pretty sure it's because of the sore legs. Then it was work and then home again and then swim lesson at 8 pm. 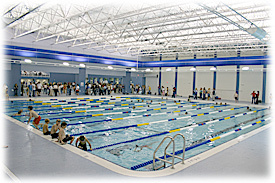 We progressed to the freestyle stroke and I was able to swim halfway up the length of the pool without pausing. I had problems keeping my feet parallel and kicking above the water until she told me to keep my chest down, it helped but I need to work on it. My eyes got irritated (I really need to find my goggles before the next class) but overall fun and tiring! First I did 5 reps of 45 lbs to warm up, then 3x75 lbs which felt pretty easy so I went up to 95 lbs and that also felt easy. 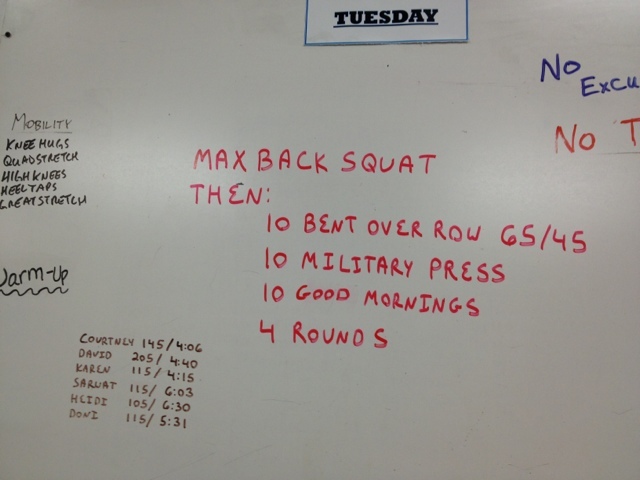 I then did 105 lbs for 2 reps and then 115 lbs pretty well but with effort and I could feel my lower back working hard. I gave 125 lbs a shot but I just wasn't confident in going below parallel in my squat so I ended there. I looked at my old posts and I have done 125 lbs 1 rep max last year but I am not there yet. Still, 115 lbs post-7 months a herniated disc is progress! I took a relatively long time to finish this! The strict press was okay for the first 2 rounds, I struggled in the 3rd round but still managed 10 strict presses and in the 4th round, I cheated a little and the last 3 reps I popped my legs to get the weight up (somewhere between a push press and a strict press). Still it felt awesome to be able to do 37 reps at 45 lbs for a strict press! I definitely need to work on heavier weights now for this movement. 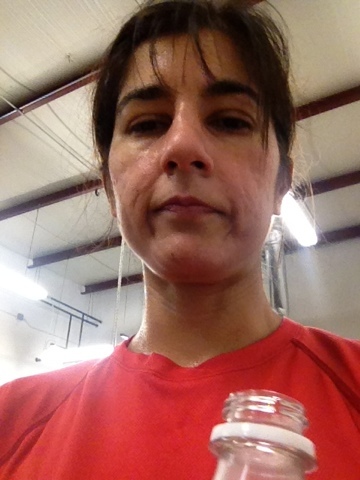 It was a good short workout and perfect first workout since the marathon. My legs felt a little rubbery still, I didn't think I could actually jump on the box (didn't even try) but it was good to go. It was fun blasting it but I slowed down on the Advanced section and we spent a little time on the drops and I tried a steep drop that I never had the guts to do before and this time did it successfully. Overall a good bike ride with good friends. We covered about 8 miles according to Strava and 9 miles according to Jim's bike computer. I wish Strava and Garmin would work out how GPS and elevation changes and the twistiness of singletrack equates to greater mileage. 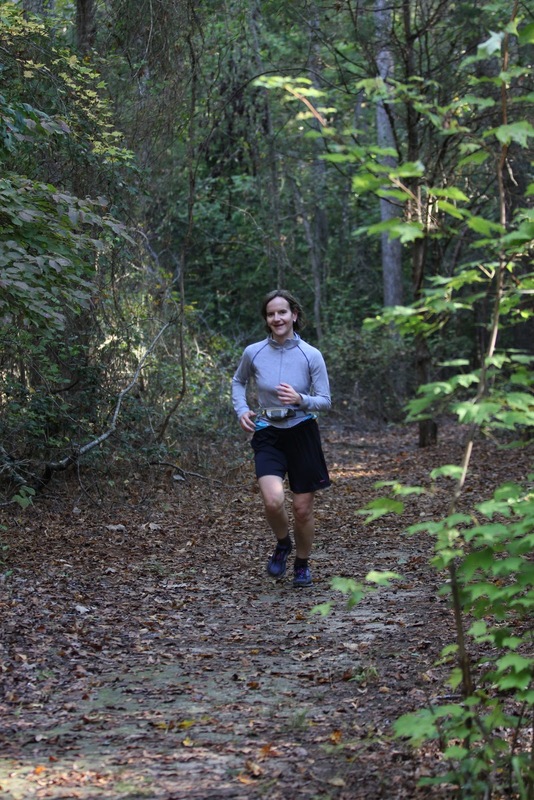 I've been procrastinating on writing up my posts since I did the Medoc Trail Marathon (my first trail marathon and actually first marathon ever) on Saturday. Although I started to feel normal by Monday, I just didn't feel like making the effort to write about what I did! 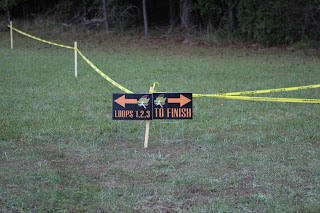 Pre-race: after Wednesday (10/10/12), there was an intense amount of resting and carb-loading. On Friday night, with my running buddies (Jim, Lisa, and Barbara plus Lisa's husband Ed tagged along), we went to Outback Steakhouse and feasted on a bloomin' onion (cleaned it) and then I had a Victoria steak 6 oz butterflied and cooked medium well with a rice pilaf and brocolli. It was delicious. We stayed in a hotel in Rocky Mount so that we would only have a 30 minute drive to Medoc State Park after. I got up early, showered, put on my race clothes, panicked because I couldn't find my headphones, and ate a breakfast of 2 slices of whole wheat bread with almond butter and tea plus 16 oz of water. The hotel suite we were in didn't have a toaster in the little kitchenette so I ended up "toasting" my bread in a frying pan, it was okay. 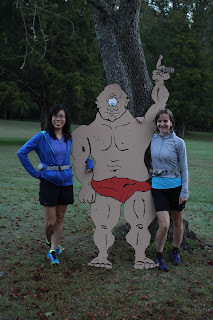 We left the hotel at 6:35 pm and got to the park by 7:10 AM (race started at 8 AM) and felt good. It was pretty cold- mid 40s but we were all excited! Parking and picking up our race packets was easy. DJ Digital Art was already playing good music and they continued that throughout the day! 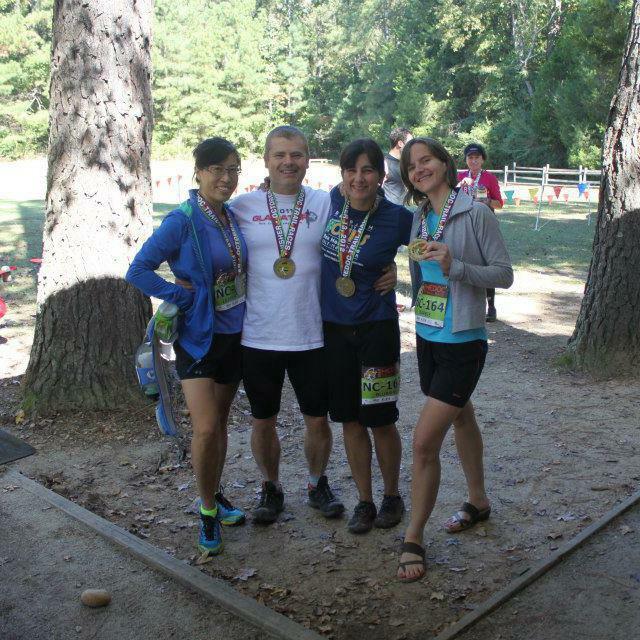 Besides the four of us, I also met two co-workers who were doing the 10-miler, Pete & Michelle. I loved that other people from work were doing this race. I decided to wear the Medoc long-sleeve shirt they gave us over my long-sleeve tech shirt instead of trying to run with a jacket on. I also had bought a belt that held 1 water bottle and a little pocket for food, I was initially going to try and run with music but didn't prepare enough for that. So I was carrying 20 oz of Nuun-flavored water and 1 mini-Larabar (100 calories, cherry pie) and 2 Cliffshot blocks. 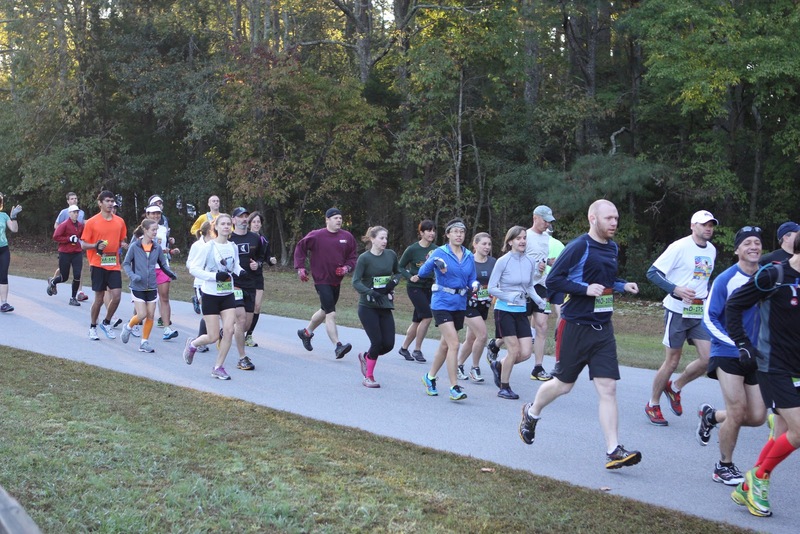 The marathon started at 8 AM and the 10-miler race started at 8:30 AM. We lined up appropriately in the back and took off slowly when the race started. It was funny, the race organizers greeted us by blowing into conch shells as we ran past them. I have never seen that before at a race. 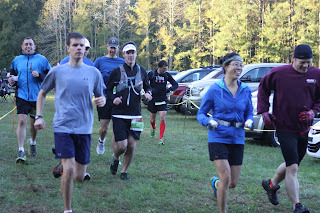 The start of the race was the bit of road leading into the park and then making a U-turn back and a left onto the trailhead, mainly to thin people out. This is the last time I saw Barbara, Lisa, and Jim! 0.2 miles into the race and I was running in the back of the pack. I'm glad we ran here in August because it was comforting to know what was coming up and being ready for the big hill at 1.5 miles. I felt pretty good but even just 3 miles into the run, my legs were feeling it- I think I still had some residual soreness from the weightlifting earlier in the week. 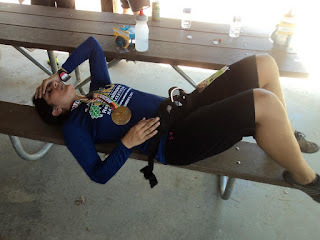 At the first aid station, I drank 2 little cups of lime-yellow Gatorade and kept on going. 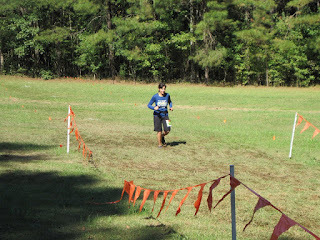 I had a Honey Stinger gel and more Gatorade at the second aid station and continued this pattern in every lap. The first lap went pretty well and I was averaging 12:20 min/miles and saw that I had finished it in 1 hour and 50 minutes. I got a little ahead of myself, thinking I could keep that pace and finish in 5 hours 30 minutes. That didn't happen. 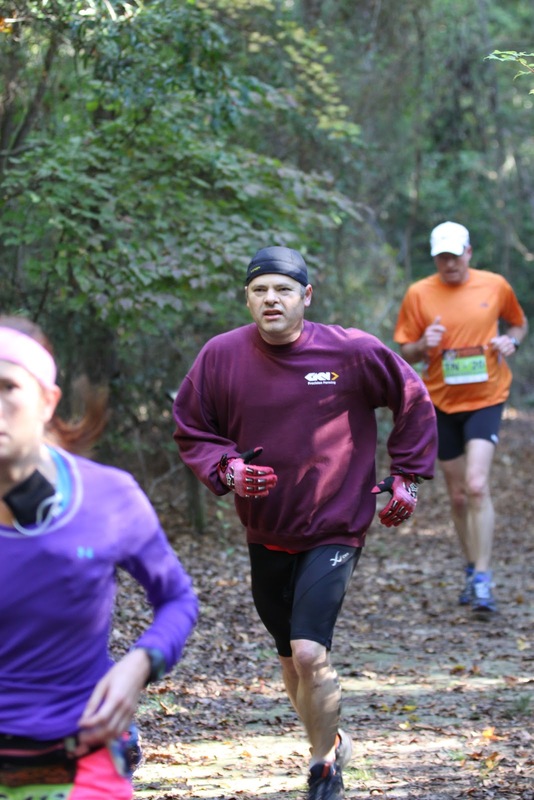 I slowed down in the second lap, feeling a bit tired and trying to conserve my energy. 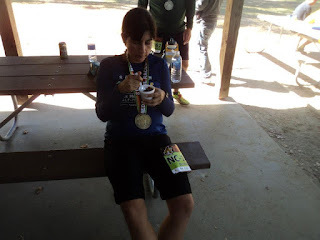 I had a Honey Stinger gel at every aid station to make sure I didn't get hungry and one time a cup of gummi bears and once some pretzels. They offered potatoes (not enticing to me at the time) and chocolate chip cookies (definitely not what I wanted in a long run). I mostly ran alone, once in a while a faster runner would over pass me but it was nice just being out there. It warmed up pretty quick and when I finished the first lap, Edward was taking down people's times (he volunteered) and I gave him my top shirt and kept going. On the second lap, I just kept telling myself to move and counting off the miles each time I saw a mile marker sign. It was great when I saw 18.4 miles done and still right under 4 hours so far! At that point, I started clocking the time and each half mile and had conversations with myself like "ok, there is only 6 miles left, that's only a little more than 1 hour" (not really for me but that is how I got myself to take the next step). I also had much time to think about what I was doing- why the hell was I running when I was so freaking slow? What was the point? Why did I sign up for a marathon when it takes me all day to finish!!!! I am never going to do this again. Why do I pay money to run? What's wrong with me. 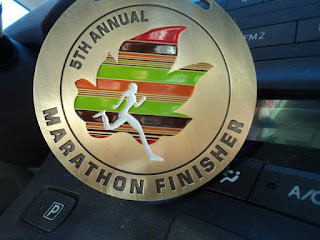 I want to do this again, I like running, I like the races because it motivates me and gets me going. I love the atmosphere at a race and the excitement. Maybe I can get faster, maybe I'm just slow now because I had a back injury this year and couldn't run at all from March-June. 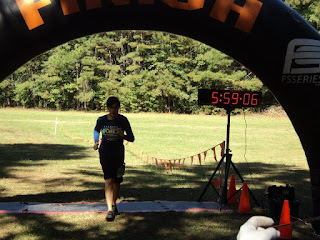 I was running the gamut of thoughts during this race. When I got to the first aid station on my 3rd lap, Frank Lilley (one of the organizers) was there very cheerful asking me if I wanted anything (he offered me everything they had on the table, I said no about 5 times since I just wanted water and a gel and was completely out of enthusiasm at this point as I had 5 miles left. So I said "I just want to finish these last 5 miles now". I refilled my bottle and ate one more gel and went on my way. There was another woman right behind me and she ran behind me for 1 mile when I tried to pick up the pace (mainly because I had been running alone and now I didn't want to hear footsteps behind me). I lost her for a bit but at the next aid station, she caught up to me (we had about 2.5 miles left!!!!!) and we were off again. 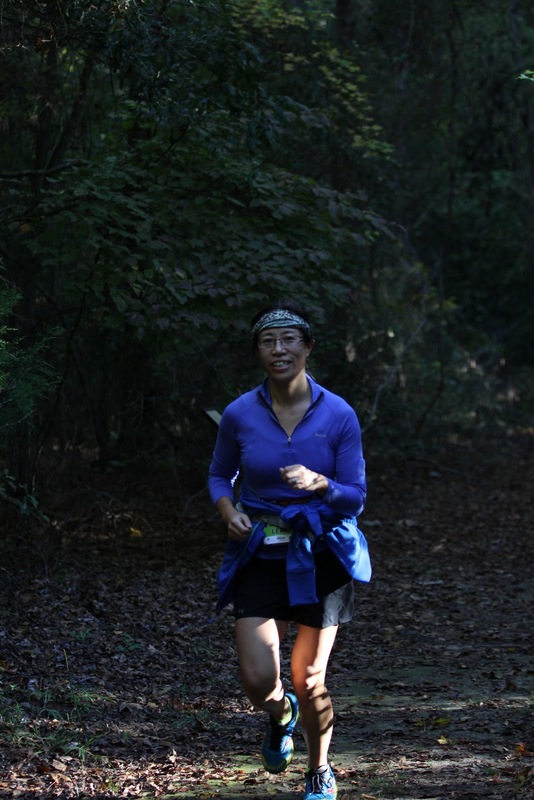 Another woman got ahead of me while I was "snacking" at this aid station and all I could think of was "damn, getting left behind with less than 3 miles to go". So me and this other lady continue to run and she trips over a giant root, I hear her yelp and I turn around long enough to ask if she is okay, she says she is (she didn't actually fall, just almost) and so I kept running and didn't see her again. The other woman in front of me- I could see her always a little bit ahead, walking and then running but I finally caught up to her with 1 mile left. Her boyfriend/husband/friend (?) was coming up on us from the direction of the finish and asked her how she was doing, she was a little emotional- her hips hurt/something else hurt which was why she was walking/running. He ran the last bit with her which was pretty thoughtful! I finally made it close to the finish line and saw Barbara, Ed and Lisa on the sidelines (cheering me on!!!) and ran the last 0.1 mile to the finish in the very muddy grass. 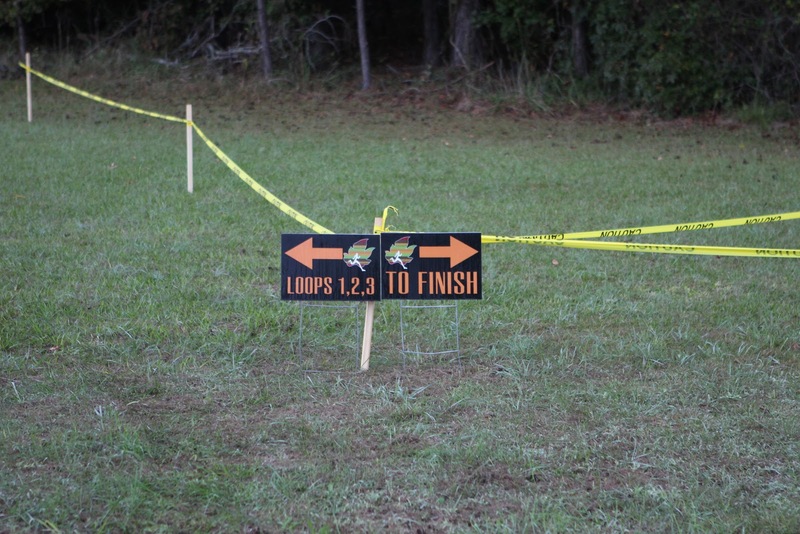 I could see the clock was close to 6 hours so I kept trying to run but it was so muddy I was losing any speed I had. I finished in just under 6 hours. Jim was awesome and was there ready to take my picture crossing the finish line and Barbara actually ran over and also took my picture! Running buddies are the best! I couldn't even smile at the finish line and just took my medal and hobbled over to a bench. I wanted to lie on the ground but didn't think it was appropriate. So I sat down and then laid down on a bench. I have never felt so tired as I did that day at that time. My legs just were jelly and once I stopped running my feet started to hurt. Those Merrell Barefoot Pace glove shoes were not much support for 26.2 miles. I also hit my left heel pretty hard somewhere on the trail and was feeling it now. What was awesome: the red beans and rice they had for us! I ate two cups, perfect post-race food. I drank a bottle of water and changed out of my clothes. We all slowly walked back to our cars for the drive back to Raleigh. I finished in 5:59:05, ranked #145 overall and #42 womens. I saw the male winner on the trails, he was a skinny guy just wearing shorts and running like a bat out of hell. I wish I could run with such abandon on the trails. I definitely took it easy on the downhills (really didn't want to fall) but I don't think I could ever do better than a 4 hour marathon on the road! All of them did outstanding, Barbara blew it out of the water finishing in 4:27 and Lisa in 4:48 and Jim in 5:04. 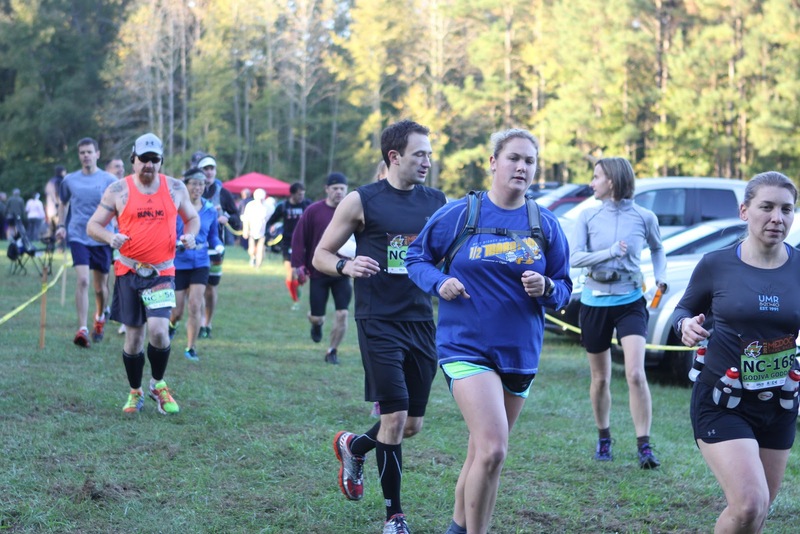 It was Barabar's second marathon and first trail marathon. 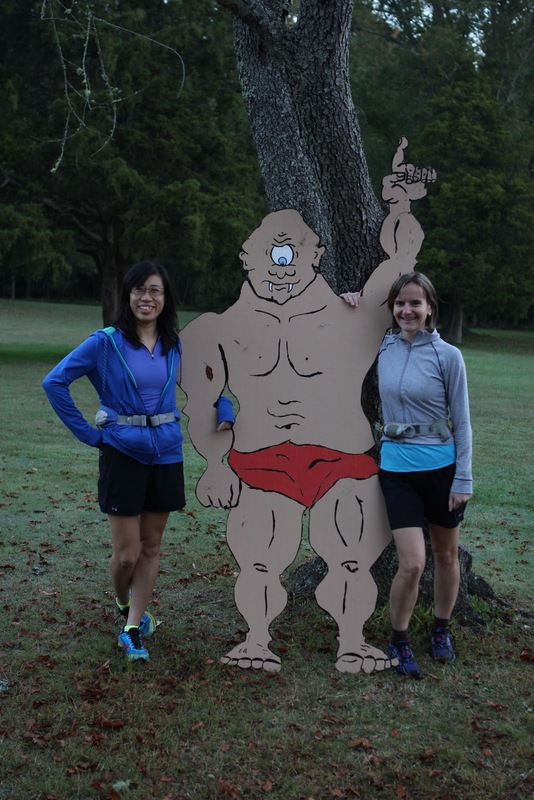 It was Jim's and Lisa's first marathon (although Jim ran 26.2 miles in the "fun run" we did at Medoc in August). All of us were pretty happy, Barbara had a fantastic run as did Lisa, Jim's left knee died at mile 24 so he had to walk the last 2.2 miles but still had a good finish considering back in August- it took him 6 hours and 3 minutes to finish the same distance. 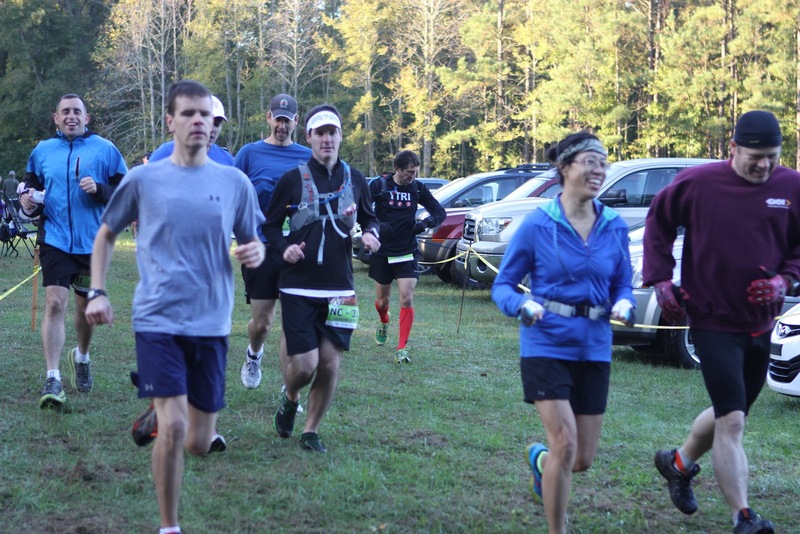 It was a great race, very well put together and I'm really glad I got to do many Sunday practice runs with Barbara, Lisa and Jim this past year consistently at Umstead and Lake Crabtree. That is probably the best thing about running, knowing there are other crazy people who think this is a fun way to spend time. I think I will be doing this again next year if I've got teammates to go with me! Happy we made it to race day, still unaware of how hard the day will be! As much as I like running, marathon training did not help me in the weight department, I gained 5 lbs of fat while my kitchen was being renovated and still running 30+ miles a week! The start of our race! We are in the middle of the pic. I think Lisa smiled the whole time. Barbara taking one look back before smoking us all! 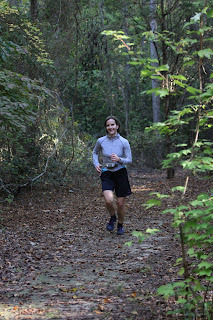 Medoc Man ~ mile 7?, they had Medoc man at different places on the trail, it was a big plus for this race! Medoc man took a little time out to get a picture with me. We had to do 3 laps before turning right to the finish. I like how the clock can be seen on both sides of the finish line, it was very, very muddy here. 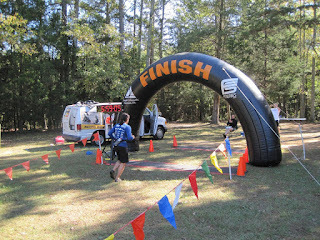 I was really tired, but my Garmin held up! Enjoying my red beans and rice. 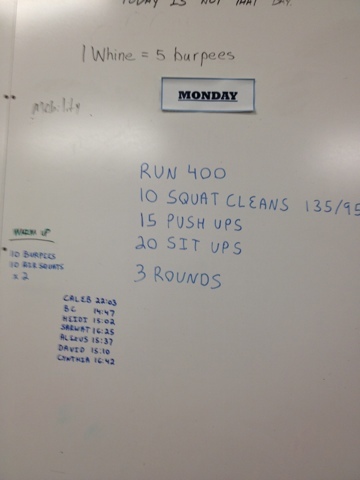 It was a good thing running was in this WOD because I was done running until the marathon! I just decided to load up on carbs (every meal had some bread or rice or pasta in it from Wednesday to Friday) and let my legs recover from the squats (I was still sore on Friday before race day). I went for one last physical therapy session on Friday also to ensure that I was as ready as I'll ever be for a marathon, ensuring that my back was in optimal health also. I did 7 rounds and quit with 1 minute left on the clock because my arms felt like they were going to fall off. 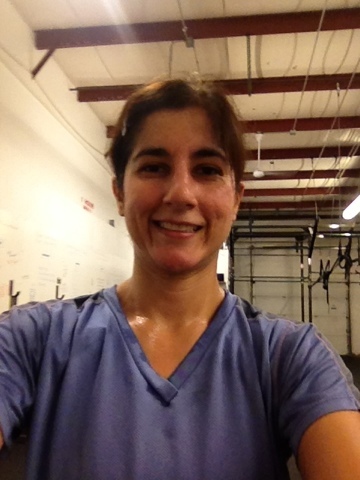 I wanted to do 20 lb dumbbells for the lunges but there were none left! This time we had a big class: 3 guys and 5 women (including me). I was proud of myself because I went heavy this time on the push press, the Rx was 75 lbs but going up to 67 lbs was a big step for me. For some reason I was thinking, well in Fight Gone Bad, I did 55 lbs and I did 20 reps in 1 minute so here I can do 67 lbs at 10 reps per round with no problems. I didn't calculate that I would be doing more than twice the number of rounds as FGB at a heavier weight! Well, there were no significant problems but that weight got pretty heavy by the 5th round when I had to start breaking up the reps into two parts, first doing 6 reps, putting the weight down and then trying to punch out the last 4 reps. Worked pretty well but left me with some very tired arms and hands. The L-sit holds (hands gripping a bar on each side and raising yourself up (straight arms) and putting your legs in an "L" position was way too hard form, I managed 1-2 seconds and then had to bring my knees to my chest to be able to hold the position. Any kind of gymnastics move is difficult for me and a continuing challenge. The weighted lunges weren't too bad with the heavier weight but my right arm started to hurt towards the end. All in all, I'm glad I went heavier even if my # of rounds was less than everyone elses! Looks easy? 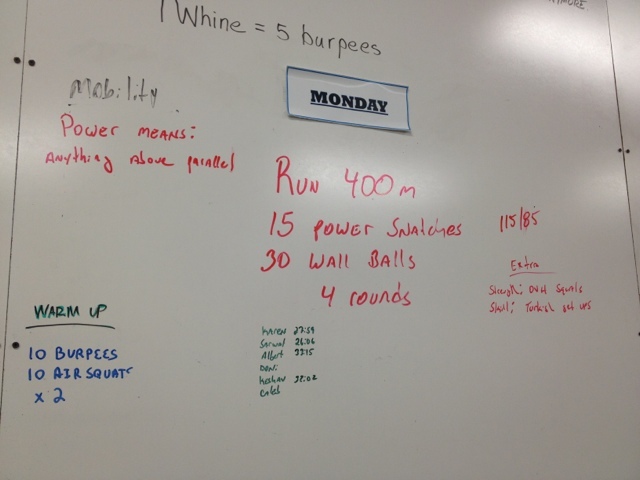 The power snatches were not so easy after 2 rounds and 30 wall balls is a lot. 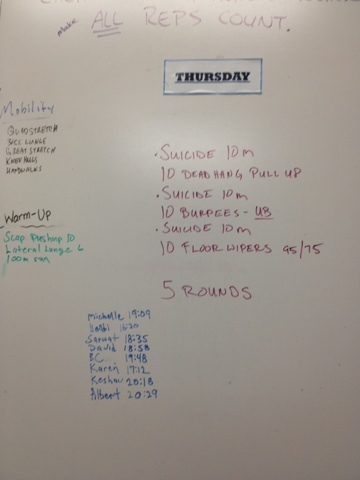 It probably took me 2 minutes just to do each round of wall balls. 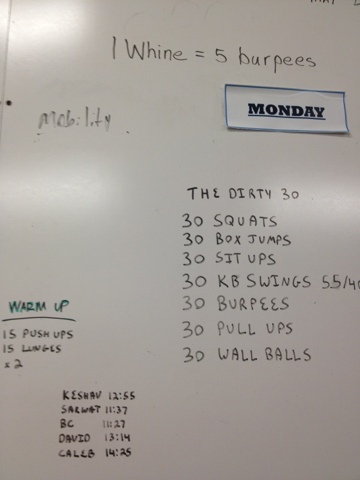 I was glad I didn't use the 14 lb ball for this WOD. My power snatches started to degrade in the 3rd round (I was pressing the weight out!). 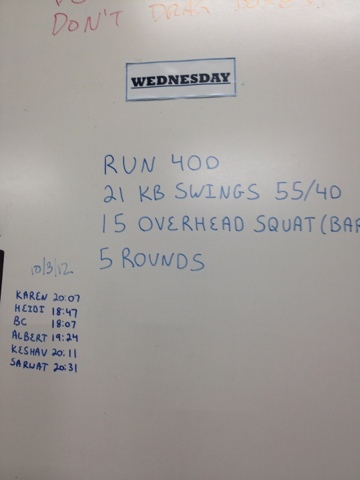 It took me 26:06 to finish, the longest WOD ever for a weekday! Afterward, Jason put up "extra" work: overhead squats and turkish getups but I only did 3 overhead squats with 55 lbs before I dropped the bar. I decided to quit at that point. It's cold and rainy here today so I wasn't motivated to run in the afternoon. I almost hope the trails will be closed tomorrow so I can run instead of bike. I'm not sure how tapering works but I am afraid if I don't run some this week, I'll do terrible on the marathon! 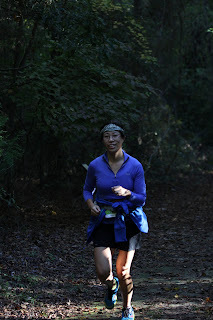 We planned for a 6 mile run this Sunday and decided on an out and back of Loblolly at Umstead State Park. About 2 miles into the run, it started to rain, then the lightening and thunder started, then it poured. We turned back at the 2.1 mile marker (reaching Old Reedy Creek Rd). It took me about 59 minutes to finish 4.3 miles. I just haven't been able to run Loblolly any faster even though I feel like I'm making a strong effort! Oh well, I'm not sure how prepared I am for the marathon on Saturday but with less than a week left, there is not much else I can do. I'm hoping to finish in under 6 hours, we'll see where I land. We had grand plans to bike at San Lee, eat lunch and then bike at Governors Creek. However, once we got to San Lee, the gate was closed and a guy was standing there asking everyone if they were with 3M because 3M apparently had reserved the entire park and no one else was allowed that day! So no San Lee for biking. We headed out for Governors Creek. I wish I had photos or video but my phone was out of memory and I didn't bring my camera. The ride was great though! It was perfect 75 degree weather and only a few other bikers were out there so we had the trails to ourselves. I did a new logstack I was afraid to try before and one of the rock garden features. It was pretty great. One loop was about 6.3 miles and then we went back in and did the trail in the reverse direction. The first time took 57 minutes, in reverse it took me 69 minutes (I was "done" with 2 miles left). And I had no snacks during the ride, just water and I survived! I'm hoping to keep riding Governors Creek on a weekly basis so I will be ready for the January marathon mountain bike race. Overall, a great ride and a perfect Saturday. I think I could have done 95 lbs, maybe even 100 but am still scared of hurting my back and messing myself up before the marathon so I was conservative! Plus I need to work on my explosiveness when I execute the move. It was fun though! On the row for calories, I did 64 calories in 5 minutes, the guys got up in the 90-100s! I'm jealous, my power output on the rower is still pretty weak but better than last year. I am glad to say the deadlifts did not hurt this time. 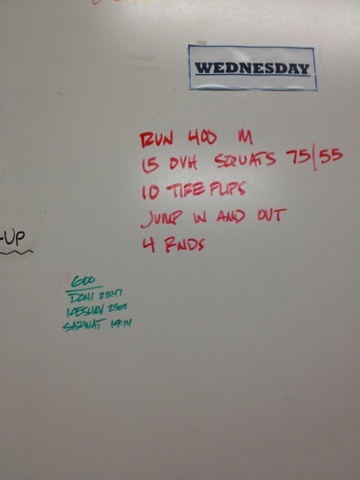 Overall a pretty easy workout with the light weight but still made me sweat! I did nothing on Tuesday. I had planned to go to Forged Fitness in the morning but when I woke up, I checked the website for the WOD and saw that it consisted of 200 double unders and a series of box jumps and sumo deadlift high pulls. This was a complete turnoff as I can't do a single double under and the SDHPs just are no good for my back so I went back to sleep for an extra 30 minutes. Then in the afternoon when I was supposed to be biking, the trails were too wet from the rain and we had to cancel the ride. The only thing I did accomplish was doing a headstand against the wall in my bedroom (first step to learning handstand pushups!). The running was hard because with all the rain we've been having, it was the thickest level of humidity I've experienced. At 6 am in the morning no less! But I got it done and 14 hours later am getting the DOMS from all those squats. I felt pretty good about doing 75 lbs but still need to work on getting into a deep squat. This past Sunday's run was hard and we only did 12 miles! It was all single track though: Company Mill and Sycamore trail at Umstead State Park. I thought I was feeling pretty good but my left heel still hurts a little from hitting a root hard last week and it hurt again every time I hit a rock or root the wrong way. It was a slow run, averaging 13:30 pace. The goal was 15 miles but when we got back to the parking lot, no one was interested in going further! I think we were all done. I really can't wait for the marathon to be over now, this training has been hard. I am looking forward to tapering back to 10-15 miles a week! It will feel like a luxury. As fall/winter sets in I hope I can work on my pace and get back to something faster! I definitely know on single track I get considerably slower than when I'm on the bridle trails and I have to work on my foot work to get faster. I'm going to motivate myself by signing up for the Little River 10 miler (January 19). I did it in January and it would be nice to repeat it to see where I stand- hopefully doing as well or better! In the afternoon I did a short bike ride with John at Umstead, mainly to remind my legs that biking is still important. We couldn't do any single track since the ground was still a little wet so we just did the bridle trails. Since my legs were still tired from the run, I decided that we would not be going up the 3 mega hills on Turkey Creek and instead went clockwise from Old Reedy Creek Rd to Graylyn to Turkey Creek. It is amazing how much easier it is to do this ride clockwise versus counterclockwise. In the end we totaled 16 miles and both got in a decent bike ride.